Julie, I find this deeply moving. As a gardener, I’m glad for this social consciousness. Glad that a gardening community can turn its art into a powerful reminder that the horror that turned humans into beasts (the ones who benefited from slavery, I mean) still devastates our human race today. Surprised too — that this is the first black designer in 103 years of this prominent garden show. Why does integration take so long? Blacks have been in Britain for hundreds of years. Brava to Chelsea for this exhibit, and brava to you for your post. Thanks Cynthia, yes staggering isn’t it that Juliet is the first female black designer. Last week the RHS appointed Baroness Floella Benjamin as an RHS ambassador, a wonderful woman who happens also to be black, I hope there will be more inclusivity, diversity and representation at what is a basically a flower show gone potty. On the TV coverage the presenters were making the point that the judges this year were also entirely male, not acceptable either. I felt both so moved at Juliet’s garden but so glad too that she was able to share this terrible message and hopefully help to change an absolutely disgraceful situation. We need more designers like her. Thank you. I follow many blogs out of the UK and beyond, many of which have covered Chelsea in one way or another and you are the first one to mention this amazing garden let alone go into the depth you did presenting it and the serious issue it represents. What a really good post. I really appreciate it. Thanks Astrid, I was very moved by this garden especially, the Meningitis garden and the installation of poppies within the Chelsea barracks were also moving but really wanted to focus just on The Modern Slavery Garden’s message for my post. The statistics were so grim that adding anything else really did not seem at all appropriate. I followed all the coverage of Chelsea this year and although I enjoyed much of it I was disappointed that several things were repeated two or even three times, completely unnecessary in this day of iPlayer. when no-one need miss anything. Fortunately this garden had a reasonable amount of coverage sadly more aimed at Juliet being the first female black designer than at the slavery issue itself. If we consider gardens art (and I do) then there is space for controversy and pieces to make you think, I’m glad to hear that she won the peoples choice for the Fresh Gardens, that didn’t receive any coverage. Yes, I know just what you mean, I watched some on catch up and could not decide if I had seen it before or not as much was repeated and repeated again. Gardens have had messages for hundreds of years, albeit less hard hitting, its a real shame that much of that is actually lost now on modern hotel style designs. What will we remember in hundred years from now? A very thoughtful garden and post – so good that you decided to profile it, because I wouldn’t have seen it otherwise. So thanks, Julie. 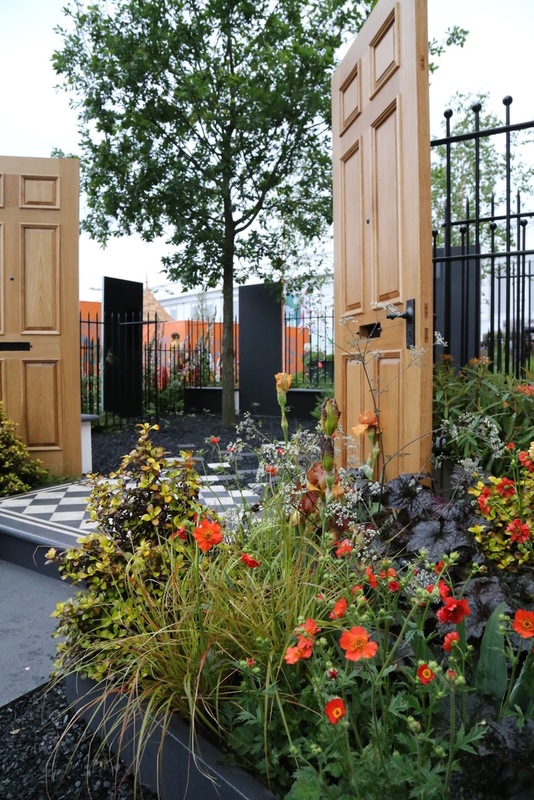 Hi Cathy, the garden was incredibly moving – I am so glad Juliet won gold and the peoples choice award. The new Fresh category with much smaller plots than main avenue has been a great move by the RHS, the cost of putting on the gardens, especially any involved with charities must be very prohibitive. Wow, the numbers are astonishing. I’m glad that Juliet was recognized and hopefully was able to raise awareness through the exhibit. Great post, Julie. The number 90 hung on the reverse of the open oak doors which represented “90% of change comes through people taking action. Only 10% by changing the law.” Hopefully more of us will question where the products we buy are made and who is involved with making them. Thanks for spreading the awareness. Oh, how I agree with the issues you raise and the comments above. Thank you so much, this is the first fully considered review of this highly significant and provovative garden that I’ve read among the blogs I follow. The garden was very moving Kate. A Chelsea Fringe Freedom Street exhibition took place in Pimlico too, with 6 anti slavery charities taking part, I missed this but my daughter who lives in London was very aware of. I had not realised how absolutely dire and extensive this is. The Modern Slavery Garden website has some heartbreaking stories. Juliet’s hard hitting garden design really deserved the accolades she received. Wow! Julie this is an amazing post. We don’t really get any coverage over here which I find disappointing and what I do get is lovely pictures in magazines but nowhere have I seen mention of this amazing designer and this very moving garden, so THANK YOU for telling us about it! The statistics are truly staggering and honestly quite sickening. I am so happy to read that she was recognized but what took people so long? So much to say about this post – I loved the idea of the oak trees being grown by survivors of this abuse and your photographs were amazing! Well done for writing about this! Hi Kate, the new Fresh category at Chelsea has enabled a more thought provoking style of garden to be built. Too radical maybe for some glossy magazines, but far more relevant to the real world we live in. Gardens for most of us are an escape from the stresses and strains of life, hopefully by choosing to buy ethically supplied and created products we can help others to have the chance of enjoying a garden rather than a dire, bleak enslaved life. That is incredible! It’s a powerful design with such an important message. Slavery seems like something in the past but it’s still so real, just hidden as this design proves. I’m so glad she won. It’s shameful that it exists at all. Such a sad commentary on how far we haven’t come. No we haven’t come far and its still fuelled by greed, money and an absolutely disgusting lack of respect for human kind and humanity. Thank-you so much for this fabulous post. I have never been to Chelsea and I don’t watch any of the coverage of the show either but am well aware how very special and ground-breaking this garden was. We as a family try to buy ethically sourced goods but it isn’t always apparent what an object’s ‘history’ is. I am surprised that Juliet is the first black female designer at Chelsea. Why is this, I wonder? Hopefully the new legislation will encourage companies and suppliers to be transparent but as you say its not always apparent. Sadly we live in a really greedy world with little respect for fellow man or the world around us. 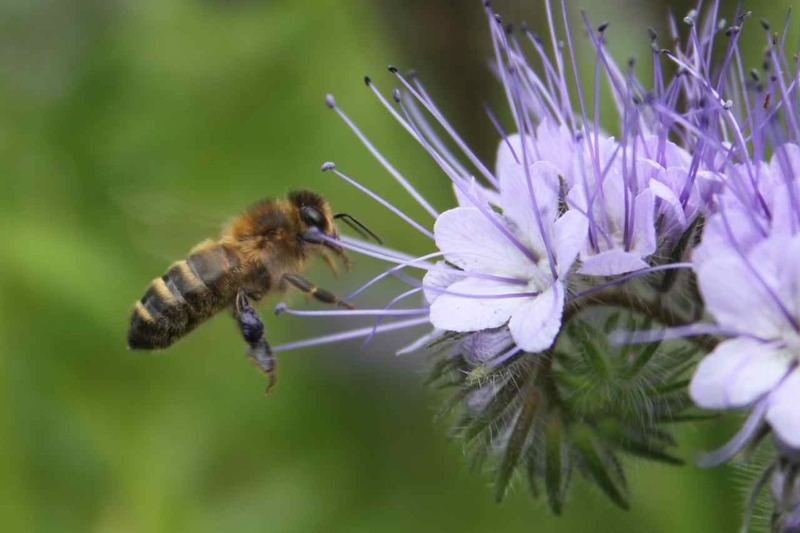 There is a lot of unethical practices in traditional gardening – destroying peat bogs, over the top use of chemicals – and it can be big business too, especially at the high end. The new Fresh Garden category is encouraging a new approach to be showcased, hopefully following Juliet’s important garden we will see more diversity and less hotel style forgettable and mostly irrelevant stuff. Julie, this is a wonderful post. We normally get some news coverage of the Chelsea show here, but there has been nothing about this garden. As others have said, it is appalling that it has taken so long for a black female designer to have a garden at the show. Your images show the garden itself to be movingly beautiful, and the statistics on modern slavery make awful reading. Thank you for sharing this. Su, in the coverage there, did you see the Poppy installation in front of Chelsea Barracks, inspired by the Poppies crocheted by Lynn Berry and Margaret Knight for your 2013 Remembrance Day. The Australian man who won best in show that year at Chelsea – Phillip Johnson, collaborated with the 5,000 poppies project and brought the display here, it was also very moving and the workmanship really beautiful. A garden with a very deep meaning Julie, thank you for writing about it. 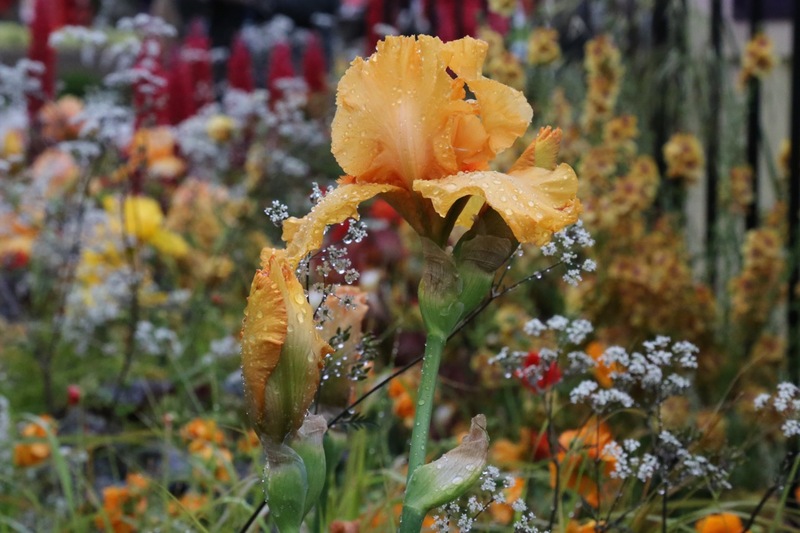 I used to read about Chelsea show (on-line of course) and at some point I got tired about too many ‘fashionable’ gardens, the next ‘must-have’ plants and so on….It is both moving and frightening. I think many people are aware about the ‘modern slavery’ practices but choose to ignore the facts. Indeed, what world are we living in?! Yes I agree, a lot of us do know and within our own busy lives ignore or are complicit in this throw away society and buy the latest unnecessary goods. Hopefully this latest legislation here will make that harder. The world has so many really appalling dreadful man made events and atrocities. Amazing garden with important message. Glad the designer was recognized. Appreciate your sharing it. I am very glad too Susie, she took a risk and was recognised by the judges and the people visiting the show. We need more brave designers here. 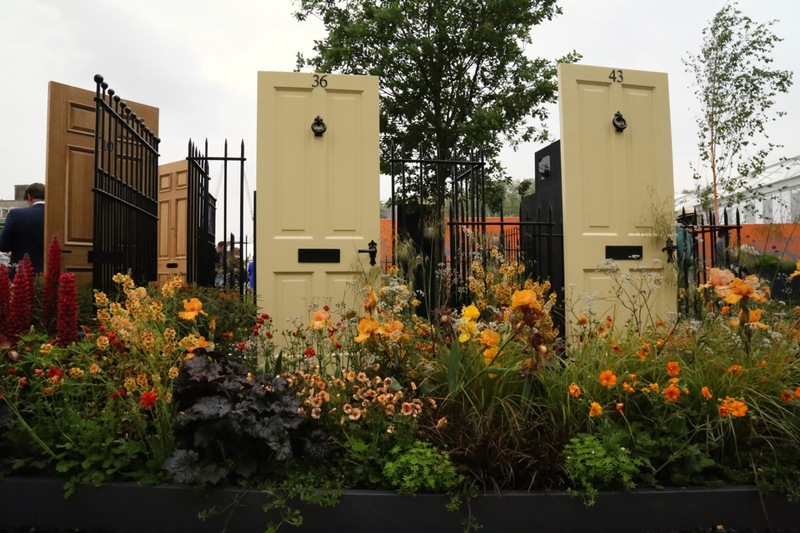 Thanks for sharing this Julie – Chelsea didn’t even get a mention on our TV so it is good to hear that such gardens are being given space – and awards! 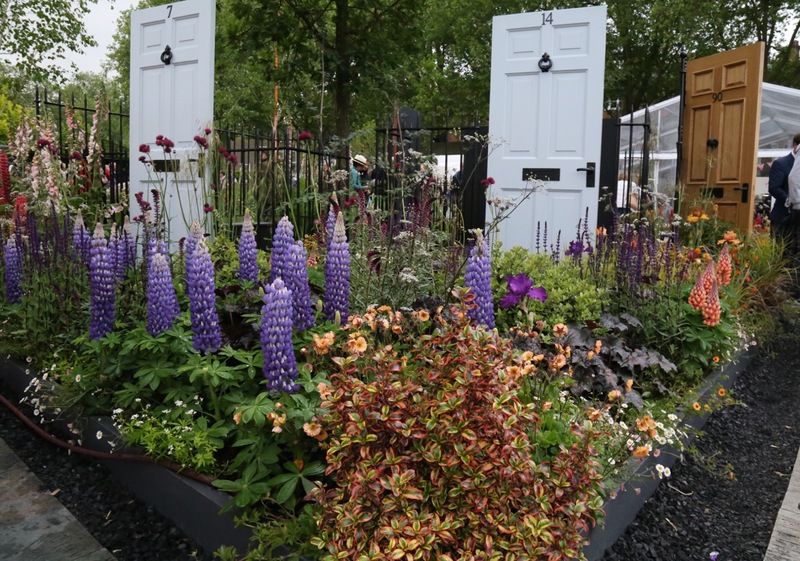 Hi Cathy, Its refreshing to see gardens with real meaning at the show, I’m not keen on the hotel style high end gardens, all seems overly indulgent. The awards were well deserved. Who knew that a garden could be so thought provoking. I agree Anne, in this visual fast moving world, making an impact on folks overloaded minds was definitely met here. What a remarkable garden! I would have to agree with you that this is a truly special garden by way of its goal of education about the issue of modern slavery (in all its ugly forms) and the imagination, and beauty, that expresses the issue and the outrage. Thanks for this informative post. While I love pretty plants, how meaningful are those pretty plants when they tell a story or highlight an abomination. Great post Julie. It is something we should all be more mindful of when buying. Lovely to read your post on this garden and on modern slavery. Even in New Zealand there is modern slavery. http://www.stuff.co.nz/business/industries/80431938/slavery-in-new-zealand-is-increasing-with-migrants-the-most-exploited Our Government tried to introduce zero hours contracts. I would consider those sort of employment conditions as modern slavery! Zero hours are at least paid, we have those contracts here. Not at all sure its the same type of exploitation, despite the lack of care and benefits. The Anti- slavery organisation http://www.antislavery.org/english/slavery_today/what_is_modern_slavery.aspx gives a grim insight into the really appalling conditions people have to endure. Thanks for sharing this, such powerful and moving images. By chance 12 years a Slave was shown on terrestrial TV two days ago, the first time I have watched this film. The photographs Vaughn has captured, particularly Inez Faust, Backyard, Ogelthorpe County, Georgia, are heart breaking. 12 Years a Slave was on TV here a few weeks ago. I tried to watch but only managed about 5 minutes; I found it too distressing. Those figures you cited are astounding and profoundly shocking. At the very least, I want company’s to be compelled to publish those reports so that I can avoid the ones that have anything to do with slavery. Absolutely, I agree, hopefully the new legislation here will be a move in the right direction to gaining transparency. Thanks, the garden’s message was really impactive.